Returning to the mall on Saturday, Yuri and Noh finish their snack. She remarks on how wonderful he has been all day and wants to go to a photo booth to take pictures together. Noh agrees, but while she is explaining how she wants him to keep the photos in his wallet all the time, Noh breaks down and says that he is sorry. Yuri begins to cry after she verifies with Noh that he is breaking up with her and has found someone new. They agree to be friends. Yuri leaves and Noh remains behind to cry. After he as collected himself somewhat, he calls Phun to ask that he be left alone for the day. Phun agrees to stay away, but has been watching Noh secretly. Yeah. You wait until I’m done with you after Episode 29. You’ll know what pain is then, mister. On the way to school on Monday, Noh is accosted by three students from another school who want to have his school pin. Rather than fighting, he gives it away. Later, those same three students corner Per. Per challenges the three, but outnumbered, he flees (and after watching the preview of Per’s fight scene in episode 27, flight truly is his best option). At lunch, Ohm teases Noh for losing his pin, but Pong gives him a spare so he won’t be fined for losing it. At the convent, Yuri is feeling down. She has her head on her bag, staring at the keychain she bought with Noh. A girl whose name I didn’t quite get sits with her and offers to do her hair, which is looking unkempt. Jeed has noticed that Yuri is down and assumes that it has something to do with Noh. She goes over to try to “comfort” Yuri and asking why Noh would leave her. She talks about how Noh is probably seeing someone else from Friday College, which causes Yuri to remember Noh and Phun’s close contact at Hua Hin. Ah, those closing credit inspirational sayings. Always giving the kids hope. Per sneaks past the vice principal so that he won’t be caught with his shirt untucked. On his way to class, he passes Mark and Win on the bleachers together. He interrupts them and asks to talk with Win privately. He asks Win if he is dating Mark and whether Mark is gay. Per somberly says that it’s good that Win has a boyfriend so Win won’t be sad. He says that he has met a girl at the convent and will have a girlfriend soon. It looks like he is starting to patch up their friendship. At band practice, Ohm notices that Mick isn’t attending. Film tells Ohm that Mick hasn’t shown up for a few days. Ohm rushes off to find out what is wrong. He finds Mick, who has finished up tutoring with Mr. Arm. Ohm can’t understand why Mick’s mom won’t let him practice and doesn’t see why Mick can’t both study and play the horn. He offers to go see Mick’s mom himself. He tells Mick to let him know about these kinds of problems in the future. Mr. Arm observes the conversation with a sour look on his face. Arm is cross. Or constipated. Or jealous. Or maybe all three. Phun arrives in the music club room. He hasn’t spoken with Noh since Noh called him from the mall cancelling their date. He is worried that Noh might have realized that he loves Yuri and not broken up with her. 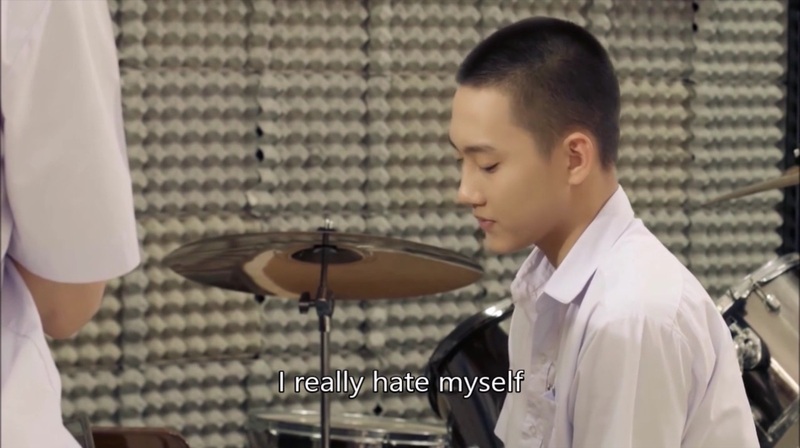 Noh tells him that he hates himself for not being able to love Yuri as she has been nice to him, but he can’t love her since he already loves Phun. Yuri is just a friend. Phun is excited that Noh as finally said “love” out loud. The boys kiss. When they part lips, they realize Yuri has come into the music room and has seen the entire kiss. I promise to keep it short this time. Really! I will. Finally, Yuri and Noh are no more. In case you thought it would be over quickly, the production team decided to spend the better part of two episodes on it. And in case you worried that you missed it, the whole thing was replayed as a flashback ten minutes later. It really was a drawn out affair. As is true for the novel, just because it appears that the challenge is over, and we can think we can safely savor the moment that Noh finally said that he loved Phun, it doesn’t mean anyone can relax. The same problems come back again and again until they are beaten to death. Yuri is back to end this episode, so we’ll have at least one more devoted to how bad she is feeling and how awful Noh feels that she is sad. I assume that we’ll have another flashback to the tears in the photo-booth to open episode 25. I can’t wait to re-watch it a third time. The break up wasn’t my favorite part of the novel, it’s definitely not the highlight of the series for me. I understand that a writer should never leave a hero free of challenges for long, but it seems like we are purposefully stuck on old challenges when the story could easily move on to new ones. I think p’Hed spent six or seven chapters breaking up this couple the second time. I hope that doesn’t mean we’ll have to go through three or four more episodes in the series. One more episode, please! It’s time to move on down the path to the new monsters. The parents await us. As do the opinions of strangers and friends. People pay good money for years of psychoanalysis to learn that. Episode 24 was more of a table-setter for the remainder of the series. (It’s over soon. Sigh!!!!). The writers were reintroducing the couples who will be the focus until the end and preparing us for one of the last of the big questions of the series: How can a person tell that he or she is in love when love is a lot like friendship? Just because Yuri is fixated on her keychain, realizing that such symbols don’t actually point to “love”, doesn’t mean we’re done with that question. No has finally figured out that his feelings for Yuri and Phun are different, but we aren’t done with that issue. Without many potential pairings left standing at this point, we’re bringing back Win and Per (finally!) and Ohm and Mick to help solve that conundrum. Not surprisingly, Mick and Win are both having issues with parents just as Phun’s father is about to make an appearance. We’ll finally get to concentrate on the couples we want and not meander over to the convent for a few episodes. I thought it was good that the writers added in Noh’s admission that he hates himself for not being able to love Yuri. In the novel that disclosure came at Hua Hin, but he didn’t tell anyone about it. 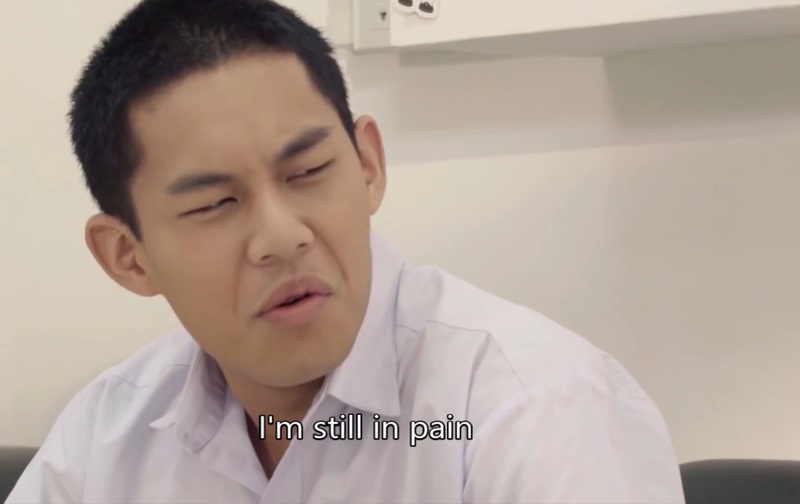 That was one of the reasons why I could never support Noh and Yuri together, since even without Phun’s interference, the longer Noh stayed with her, the more he was going to hurt himself. And hurt Yuri, too – I won’t forget that. Unless ones goal in life is to give up happiness and learn to live with one’s own self-hatred, that relationship could never be considered ideal. That may be the purpose of life, and it’s certainly the way a lot of people I have met behave, but it’s not a course I would wish on 17 year olds in TV dramas. People pay a good money for years of psychoanalysis to answer that question, too. Fight! Fight! Fight! And the differences between big brothers, friends and lovers. This entry was posted in LGBT, Love Sick (The Series), movie reviews, Thailand and tagged LGBT, lovesick, phun & noh, review, thailand, TV Series. Bookmark the permalink.